Finally, the digital switchover has begun in New Zealand. Households at Hawkes Bay and West Coast area of the South Island have gone digital on 30 September 2012. In 2010, the government decided that the old analogue signal will be shut off. They projected that television will be watched via digital TV signal beginning 2012. 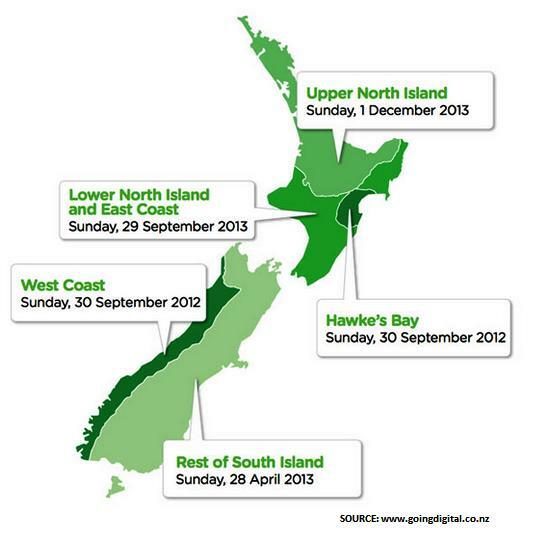 The photo below shows the schedule of digital switchover in New Zealand. Get ready now. Enable your TV system to receive digital signal. If youre subscribed to SKY or getting channels via Freeview or TelstraClear, youre watching through digital signals already. Those with old television sets, you need not buy a digital TV. You just need to buy a set-top box that would enable your old TV to display digital TV signals. Take note that this conversion would require you to install UHF aerial or a satellite dish. For technical assistance, call a UHF aerial installation company. It is important that you get precise technical advice so that you can transition to digital without any hitch. Give Kiwisat Ltd call now at 0800 563 458.